I could use advice, I'm not really in the cruising loop. Don't know if this the right forum, but here goes. This is an old sailing "barge" called a Lemsteraak that has been in the Netherlands for the past 20 years. She is a US flagged vessel and I was looking into putting her on a freighter and bring her home. I then talked to a friend who thinks there might be interest by someone in the states to continue voyaging her in Europe. She doesn't get much use, maybe a few weeks to a month a year for the past 10 years. I figured when I retire I would have time, yeah ..... maybe time to pass her on. These boats are very nice and the word "barge' does not do them justice, and surprisingly, they sail quite well. What is the size of your Lemsteraak? Is she carvel planked? If so it must have taken some steaming to get those stern planks in place? many of them are now built in steel, and some in GRP. BTW the "real" sailing barges (Skûtsje is the Dutch word for it) are all riveted steel plates I think. She would be great in the shallow waters of the Chesapeake, not well suited for open water. If the goal is to sell her, knock $20k off the price and sell her where she is. Shipping her to the USA could easily cost $15-20k and then while she appears to be a beautiful boat, she would be an oddball in the USA which from a marketing perspective would drive down the price. In her native waters, you will save the transport costs and have buyers more familiar with the design. Is she VAT paid? I'm assuming yes if she has been there for 20yr but you never know. That might mean a little deeper discount but no reason it has to be sold to a US Citizen, just need to make the price right. Very cool boat. How much are you asking? There are many kinds of "aak" (Dutch for "ark" or "barge") of which the Lemsteraak (an "aak" evolved in a place called Lemster) is but one. It is characteristic of all these "aak"s that they were developed especially to serve the "binnenvaart", the freight traffic on the inland waters of northwest Europe such as the Zuiderzee (now called the "Ijselmeer") and the rivers and canals. The Lemsteraak was a bit apart from the others in that it was primarily designed to serve the herring fisheries in the Zuiderzee before that water was enclosed behind the Afsluitdijk (terminal dike), and became a freshwater lake in which there are no herring. The Lemsteraak fell into disuse with the building of the dike. As opposed to most other "aak"s, which had hard bilges, the bodyplan of the Lemsteraak was characterized by almost semi-circular sections. This obviously has implications for form stability and would detract from the vessels ability to "keep the sea" in open water. That was not of great consequence for their intended use since they were evolved for inland water with very little swell and wave due to the extremely short fetches. The vessels had no ballast keels and no internal ballast so, as was often the case in days of yore, if ballast was needed, it was taken aboard in the form of stones. Normally the catches of fish in the hold were sufficient ballast. Nowadays Lemsteraaks built during the last century or so race (on inland waters) as a "class". I believe that to sail a racing aak well, you need a crew of eight or ten. I would think that to sail an aak shorthanded, you would need a lot of labour saving devices. All in all, I would think that there are designs far better suited for North American use since both sea and wind conditions are significantly different here from the ones that obtain in the native waters of these craft. Trente Pieds seems to have the best advice. There was a very small (37') motor barge from Holland, fiberglass hull, around 25 years old as I recall, that a guy brought to SF Bay several years back; he parks it in a small marina over in San Rafael, CA. I took a look at it, scouting for an idea for a small motor vessel to keep and use in the Alameda-Oakland estuary (I have sailed in and from there for just about 50 years), but the only berth was beam to beam forward and I couldn't fit. I'm only 6' tall, but the long dimension was 6'. Also, winds and currents in the estuary (along with considerable boat traffic) makes one of these very difficult to use here. Overall, I love the idea of these things, but their market value here is very limited. Millennials don't want to buy anything at all (sailboats, motorcycles, even cars and houses) and are in general not mechanically inclined. We're seeing a downturn in the market for those items, as boomers like me age out of them. 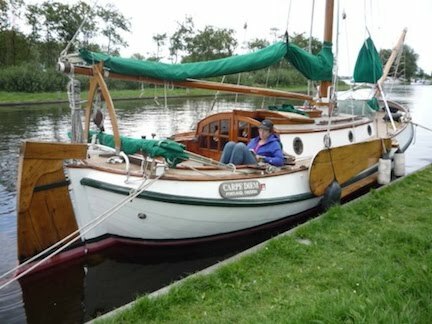 My wife is Dutch and has relatives still in Holland; we would get a kick out of using your boat for a week as an Airbnb type rental. That may be its best use by a new Dutch owner (someone who wishes to use it occasionally and rent it out the rest of the time). I wish you good luck. I’ve actually seen one or two, that seem to do very well in the ICW. Just be real cognizant of the weather on any open water crossings of course. I’ve not seen one under sail. Last one I saw came into Brunswick Landing Marina, I assume got fuel and left, it didn’t stay. French flagged vessel, and you could tell the brightwork was beautiful as it was all covered under Sunbrella. Must be a life’s work to maintain. This was a much larger vessel that this one here though, I figure it was a custom build. Thank you for the advice. 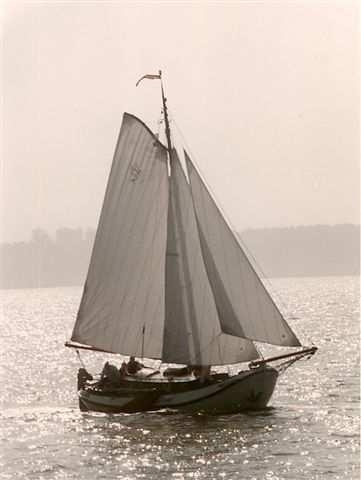 She is a rare boat and I found her in Florida in the early 90's and after a year touring Florida shipped her to Amsterdam to explore Europe. We lived on her for about five years and went everywhere from France, Germany even to Switzerland. While it sounds like inland navigation is simple and easy the reality is that it takes a lot of energy and can be quite dangerous at times. This boat is well suited to it as the hull is steel and draws less than three feet of water. I can see keeping the boat for maybe a couple more years. She would be a great boat for the Columbia River but I'm not sure anyone else would want her here. There was a very famous old Dutch Botter that was left to die near Astoria, the Dutch brought her home. I tend to agree with those that think that she might not have much value here. So, if she isn't coming home, I could sell her in the Netherlands but I was wondering if she might have value to someone here in the states? I wouldn't recommend her to someone that is retired and looking for an easy boat. What she excels at is as a calling card to meeting locals. The salon table seats seven and great for dinner parties and we have met a lot of great people. The current setup is perfect. Fly into Schipol, take a cab to the boat, they put her in the water and off you go. She is stored inside a shed and it isn't expensive. The drawback is that to really cruise the boat you need something more than the automatic 3 month visa. My friend was thinking it might work well for several owners? Something of a club, like a fractional ownership. This may be a case of apples and oranges, but there is a similar vessel for sale in Toronto for $CAN15,000. Maybe tell us some specs and what you are thinking in terms of pricing. Any major issues that need to be addressed. I agree the 90 out of 180 schengen is a challenge but especially for inland cruising in the north of europe can be very doable for the right person. Spend 3 months spring and fall of each year when it's warm enough but don't need air/con. We tried it in Spain with a small catamaran but work got in the way (2 weeks at a time isn't enough to really cover any ground). In a few years, work may settle down and we might try again. Ernle Bradford did some serious cruising in a Dutch barge. The books well worth reading.